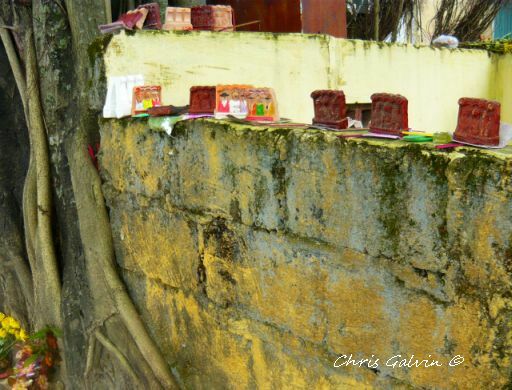 This is the wall surrounding the altar at the foot of our bodhi tree, of which a small section of the trunk is visible to the left. All those small rectangles on the top of the wall are kitchen god statues. There are more at the base of the tree. Today is the 23rd of Tet, a week before the Lunar New Year and the day the kitchen gods fly up to report to the Jade Emperor about each family’s activities in the past year. Last night, we cleaned their altar and put out fresh golden chrysanthemums, and mangos draped with votive money to encouarge them to give a good report for our family. A positive report will ensure that the coming year will be a good one. According to legend, the gods leave at midnight. People in other regions of Viet Nam believe the kitchen gods fly to heaven on golden carp, and release carp into waterways to ensure that they will have steeds to ride, but this is not a custom in Hue. Before the break of dawn this morning, my father-in-law was outside burning the offerings. Then we placed our miniature kitchen god statue on a clean plate and brought it out to the altar under the bodhi tree by the river. Each year, the old statue is replaced with a new one. Some people replace the entire altar. All day today, people in our neihgbourhood have been doing the same, and the collection of statues, old flowers and altar decorations under the tree is still growing. The walled altar is for the souls who died away from home during the Tet Offensive of 1968, although not everyone in the neighbourhood agrees. Some say it is for the wandering souls of all important local people who died away fom home. Those who can’t be given a funeral at home, whether because they were abroad or because they were MIA, as well as stillborns and babies lost by miscarriage, cannot be honoured with an altar inside the house. Hence there are outdoor altars everywhere in the country. Nestled in niches of the gnarled trunk of our tree are several more small altars for people who died in traffic accidents nearby and for other souls of this neighbourhood. 23rd Tet is considered to be the first day of the Tet holidays, and the next week will be filled with ceremonial “eating the end of the year” (an tat nien). On the 30th Tet, we’ll have the most important ceremony of all: we’ll make offerings to see the old year out and the new one in. The following day will be the first day of Tet. This entry was posted in Breakfast Under the Bodhi Tree, Creative Non-Fiction, Memoir, Photography, Photos, Viet Nam and tagged Huế, Tết. Bookmark the permalink. Very interesting post, Chris. I love learning about other cultures. I remember the Tet Offensive. We were so clueless in the States….never knew that Tet was the name of a month, much less that Tet was the time of a very significant holiday. Maybe you’ve blogged about this before, but are there other reminders of the Vietnam war there in Hue? It was the center of a lot of the conflict. Hi Evelyn, Yes, there are many reminders, You are right about it being the centre of much conflict. Sometimes during construction projects or road repairs, large quantities of bones are unearthed. I havent blogged much about it, but I do discuss it somewhat in my book, so whenever it becomes available, you’ll be able to read more. I was wondering if the younger generations are as diligent about following the old customs as their parents and grandparents. It seems with each generation, and as society (at least in other places) becomes more secular, the younger people are less diligent about keeping up these old ways. You mentioned your father-in-law burning being up early and burning offerings. I could almost hear snickering from teenagers at the idea if that were taking place over here. But American teens tend to snicker at pretty much everything. These practices are so common here that no one snickers, and many younger people also take part.I think they are becoming less diligent though, as you say, and less believing. I’ve noticed that many of the meanings behind the rituals are forgotten. What a fascinating insight into Vietnam life. Thank you. May you and your family have good reports from your Kitchen Gods. Thank you for sharing these traditions and remembrances for all souls. Continued success with your book. I finally entered a haiku contest…last month. But I won’t know anything until March. Thanks, Jules! Happy New Year and best of luck with the haiku contest. I’ll keep my fingers crossed for you.